On August 4th, 2012 the Boryan men headed west. Montana is where it all began for the American strain of Boryans. 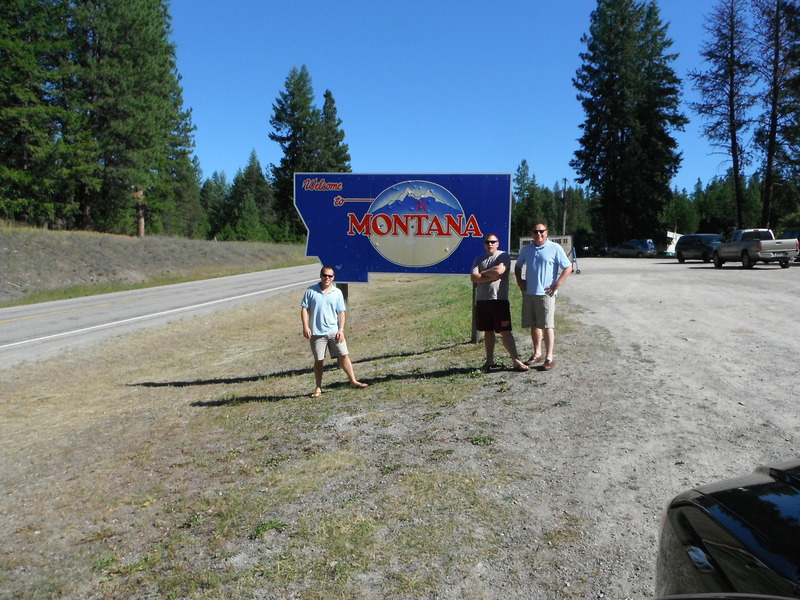 We flew into Spokane, WA where we rented a masculine truck minivan and Chris steered us towards Libby, Montana. 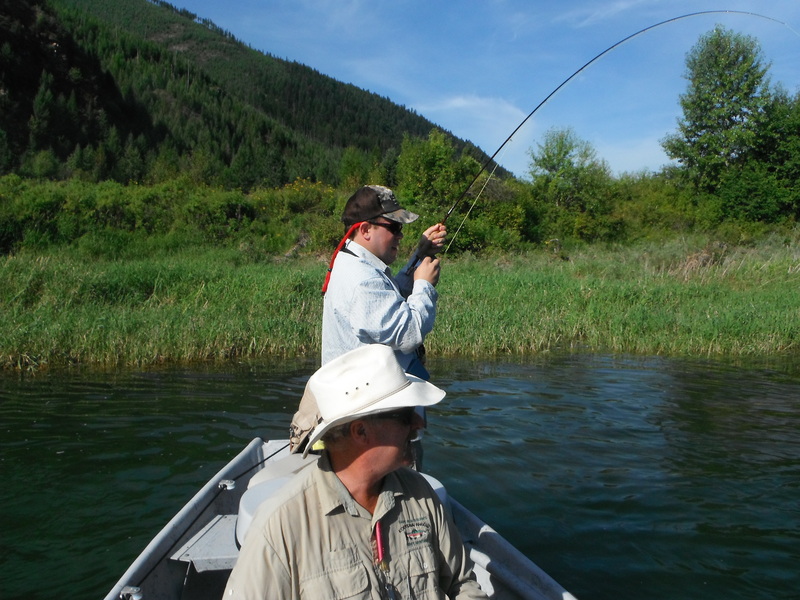 We were headed for the Bett’s Cabin at Kootenai Angler. 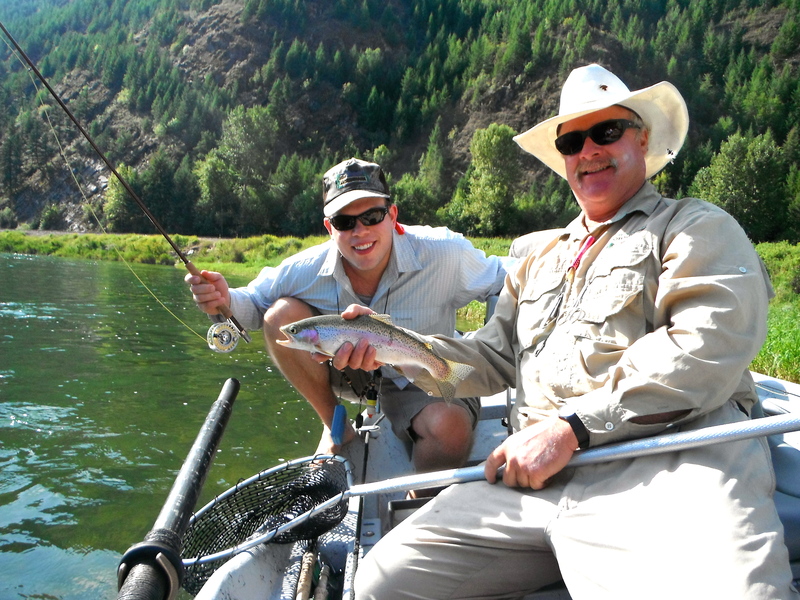 Dave Blackburn is the proprietor of said establishment and has thirty years of experience guiding on the river. He also owns a fair amount of land on a prime piece of the river. We stayed in a cabin literally 30 yards from the high water mark. The first thing I did was don my waders and head out to the current seam. My first victim fell for a swung partridge and orange; there was a caddis hatch going on. We spent the remainder of the day Saturday talking about how lucky we were to finally be in Montana. Sunday we went exploring in the town of Libby and drove up to the Libby Dam. 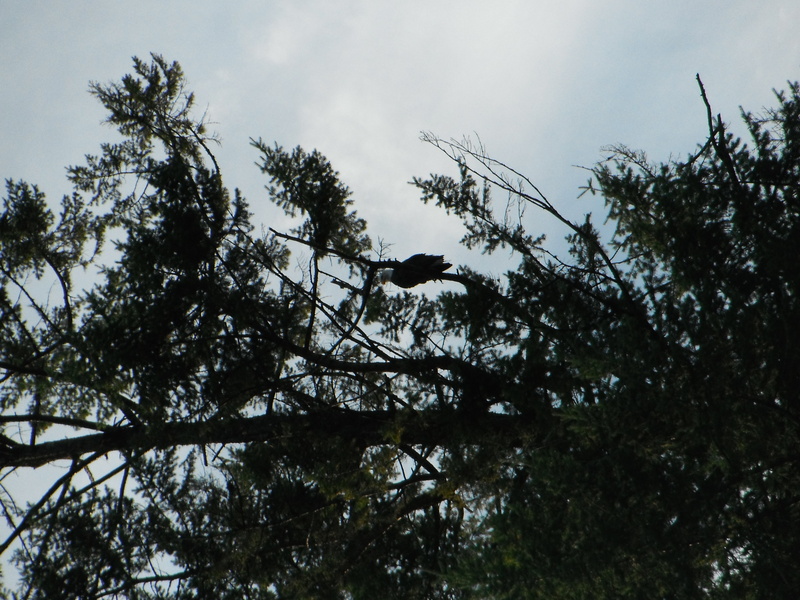 We fished below the dam and met some locals. 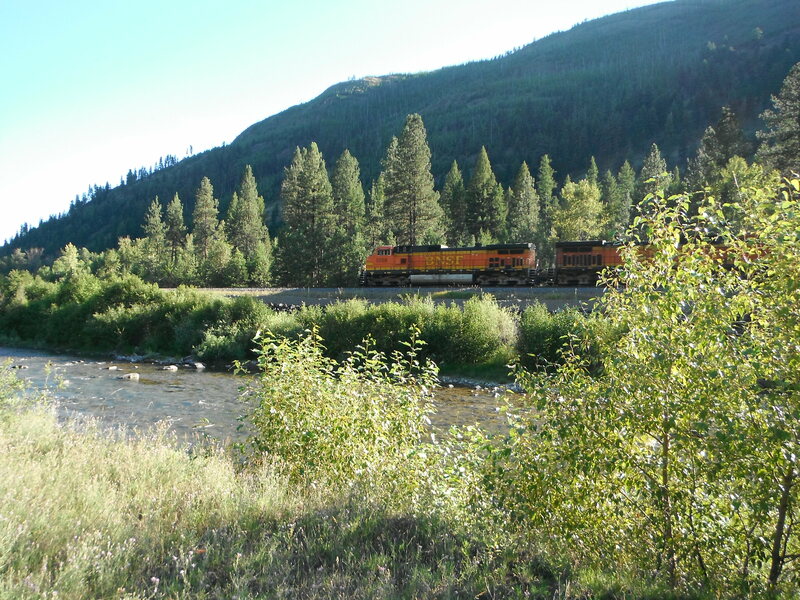 Dad and I ventured up a tributary of the Kootenai called Fisher Creek. Hiding behind a sagebrush as we pulled down the dirt road in our awesome 4×4 off roading 16″ clearance minivan were two turkeys! 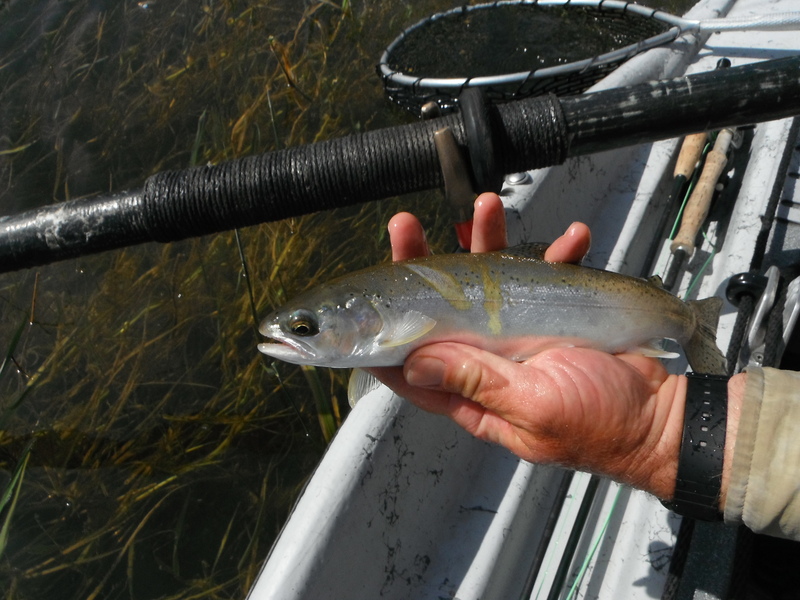 Unfortunately, the water temp was 72 F, a little too warm for trout. Both evenings were spent at The River Bend Restaurant where we consumed tasty prime rib and quaffed some local brew. Monday morning was a 0700 wake up with my favorite type of coffee. The Percolator. The float trip was absolutely amazing. There are no other words to describe it. 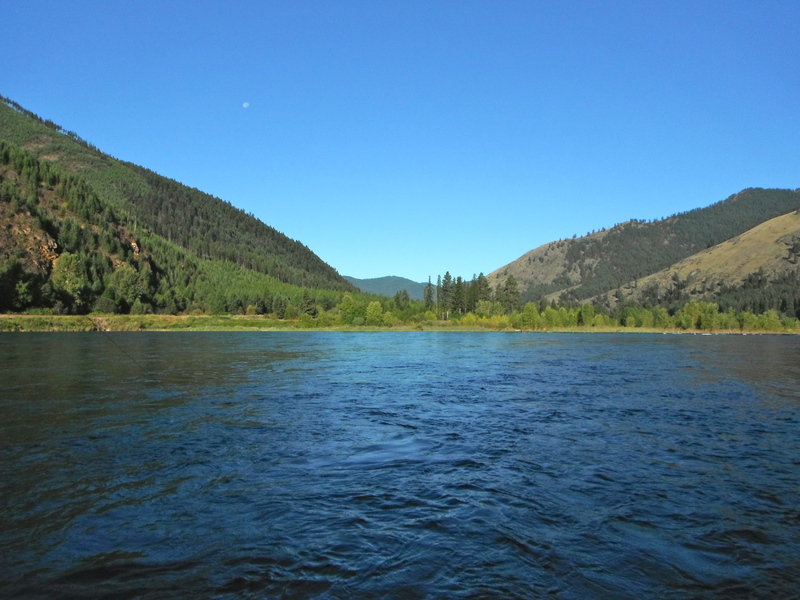 I had a lot of expectations in my mind about what it meant to fly fish in Montana. 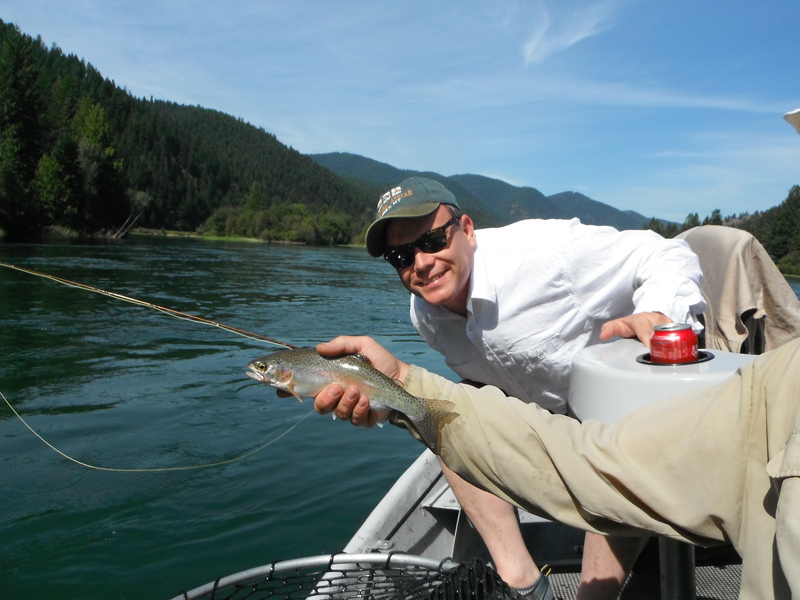 I expected large, wild, colorful rainbows to see my fly, poorly presented on account of the wind, and just skip the whole fly to jaw connection and jump into the driftboat for a “hero shot.” Honestly, a couple of hook-ups went exactly like that. We started about a mile or so downstream of the dam. The riffle Dave took us to was already in the midst of a caddis hatch with plenty of fish looking up and sipping emergers. In the preceding months my brother refused to let me teach him how to cast. 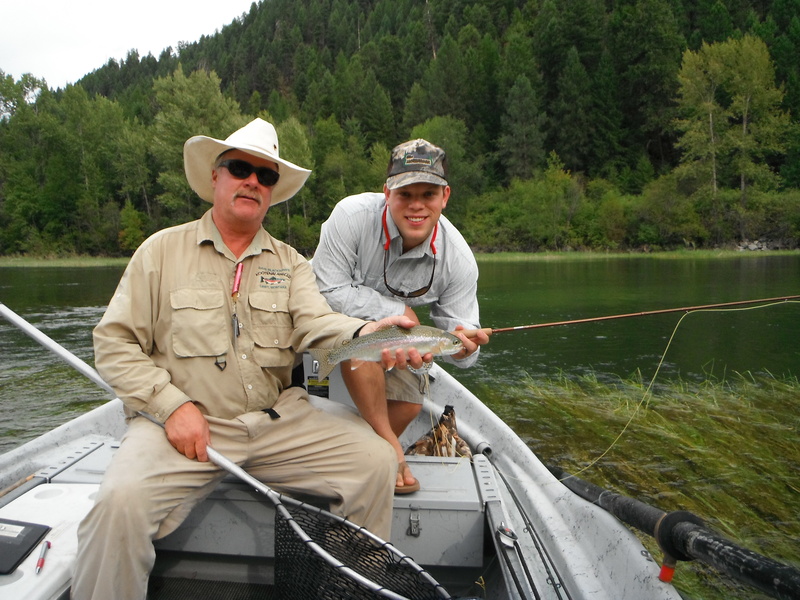 He wanted a professional guide to mold him “the way a Marine sergeant molds an eager infantryman.” Dave’s instruction needed only a couple casts and Chris was into his first fish on the fly! My dad was up next and he caught his share of fish as well, including this interesting fish. 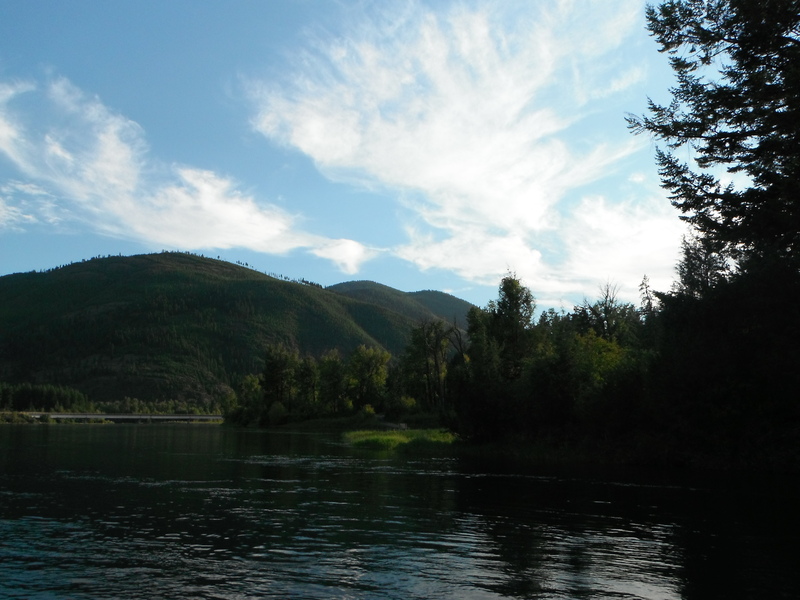 The next stop on our idyllic float was next to the portion of the Kootenai where the aforementioned Fisher Creek enters. 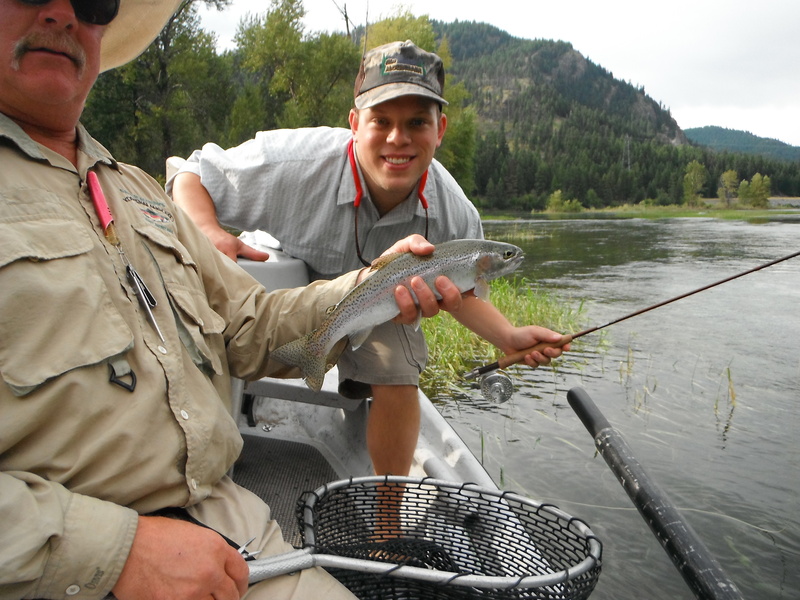 Dave said this warmer water influx harbored the possibility of some westslope cutthroat. We switched from caddis emergers to a large hopper pattern. I think Dave was somewhat impressed by my casting and line control but I definitely knocked myself down a couple pegs by missing some pretty obvious strikes from what were clearly large fish. Persistence paid off; at the top of the “home pool” I hooked into the largest fish I was to catch that trip. A little bit over seventeen inches. 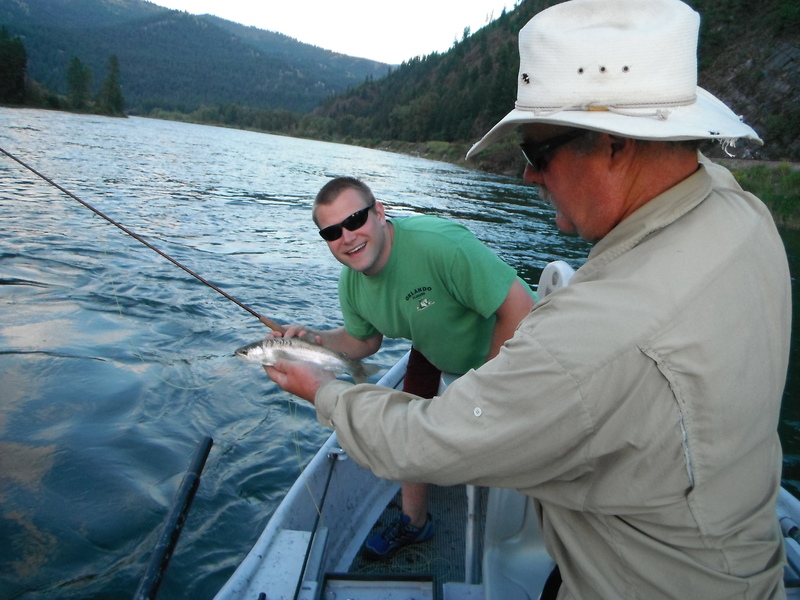 I had to fight that fish for almost ten minutes before we got him boated. 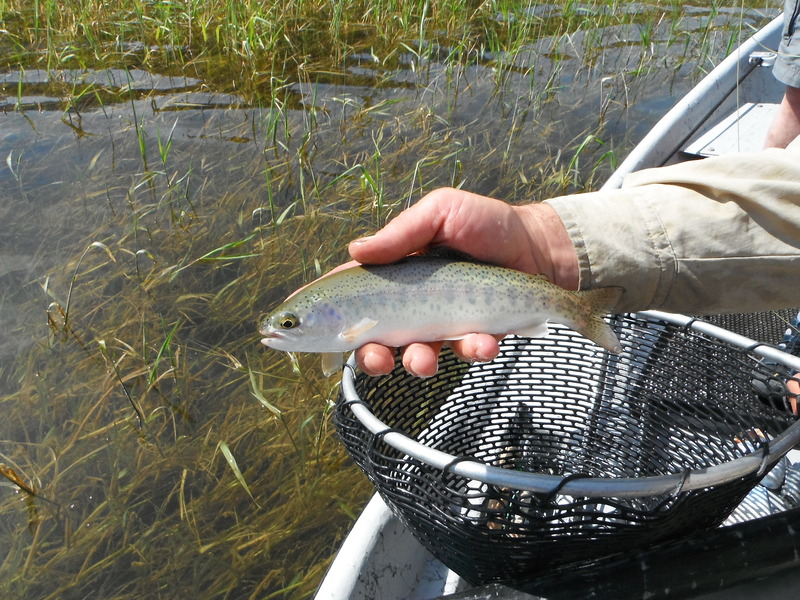 17″ is a large rainbow for the Kootenai. Because the water is all glacial runoff, it lacks many of the nutrients found on tailwaters such as the Missouri and Madison. What the fish lack in overall length, they MORE than make up for in spirit. These fish are all native and wild fish. 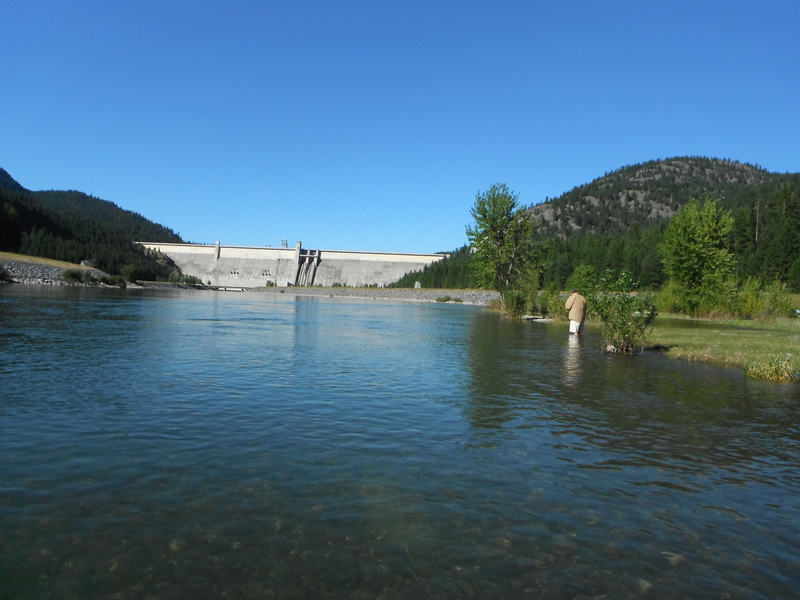 The Kootenai eventually drains into the Columbia which drains into the Pacific. 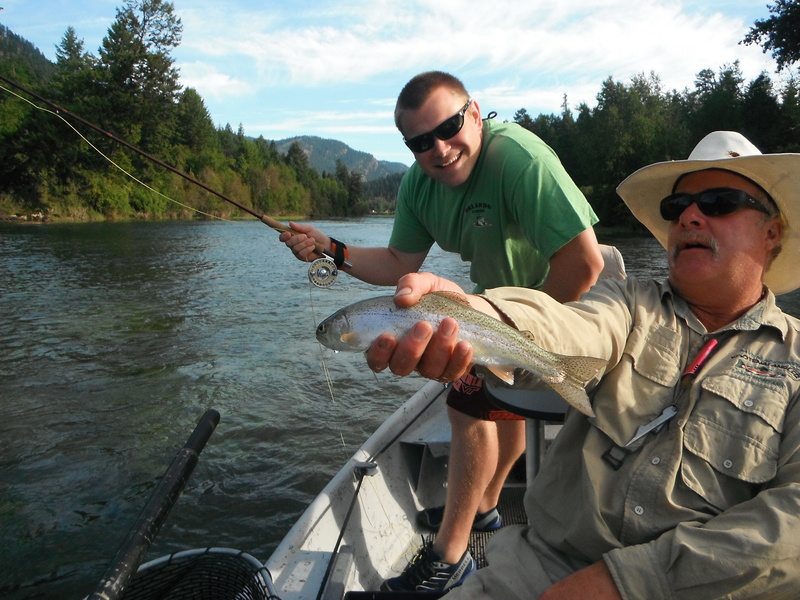 There are numerous dams blocking passage from Pacific to Libby in 2012, but pre 20th century these fish shared genes with the same rainbows that promoted the large stockings all across the US Even the 8″ fish that you hook into in this river had the ability to bend my six weight almost in half. We took a midday beer-fueled nap and met up with dave at the base of the dam to float a different section in the evening. Halfway to the take-out we ended up in the middle of what I can only describe as a PMD explosion. At one point it seemed like the water was boiling as we spent about thirty to forty minutes hammering this riffle. The fish didn’t care that they were being lined every other cast or so. It was almost unfair. We ended the evening on the famous home pool during what Dave called the Happy Hour Caddis Hatch. My brother couldn’t stop hooking into these fish. Again, they weren’t breaking the ruler but they put up one hell of a fight. 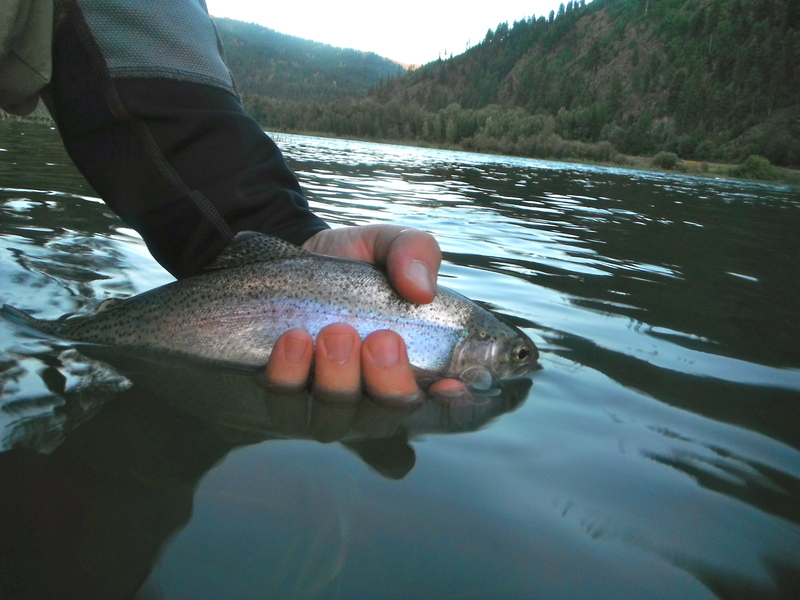 This entry was posted in Fishing Report and tagged Columbia river redband rainbows, dave blackburn, david blackburn, fishing report, Fly fishing, kootenai angler, kootenai river, lake koocanusa, libby dam, montana, montana fly fishing, rainbow trout, river bend restaurant, soft hackle nymph, swinging flies, traditional wet flies, westslope cutthroat. Bookmark the permalink. I will forever be thankful that my guys made this trip. Just a great time together, sweet memories and incredible photos.